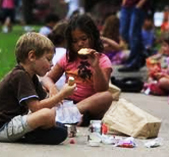 The City of Providence’s Summer Food Service Program for Children is now operating in neighborhood centers and parks throughout the city. The federal program, which is administered by the Department of Parks & Recreation in conjunction with the Rhode Island Department of Education, serves free breakfast and lunch to children at 31 area recreation centers, pools, water parks and community organizations. For more information on the program, contact John Rotatori, Director of the Summer Food Services Program at 785-9450 ext 231.